The new BMW 4 Series is one of the most popular ranges BMW has to offer because it comes in a choice of sedan, coupe, or convertible. In addition to that, it has a wide variety of features to make it one of the most advanced series of cars on the market today. One thing all the BMW 4 Series cars have in common is that they back up their looks with incredible performance. They come with 320 horsepower TwinPower Turbo engines that can push them from 0 to 60 in less than five seconds. It also comes with an all-wheel drive system to minimize slip, improve traction, and stabilize the handling in most conditions. Would you like to look at a BMW 4 Series sedan, coupe, or convertible for yourself? 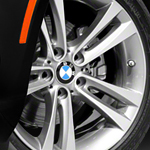 Come down to BMW Seattle and set up an appointment with one of our sales professionals as soon as possible.